With this being the last week before Halloween, I was trying to come up with something my buddies would like to create. My buddies are young so my crafts have to be fairly simply. Ghosts are pretty easy and we hadn't made any of those yet. 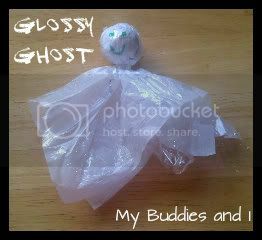 I decided to glam up the common tissue paper ghost a bit. Here's what I came up with. 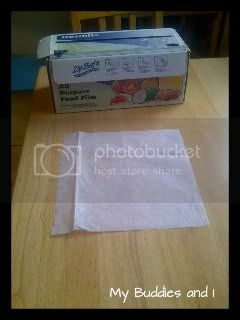 I took a piece of tissue paper and cut it in a square just a bit smaller than my roll of plastic wrap. I spread it with glue and sprinkled silver sparkles. 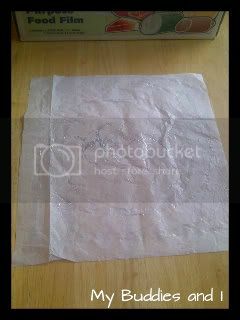 To help the glue spread and sparkles stick better, I folded it in half and pressed it together. When I opened it again the sparkles were mostly stuck to the glue. 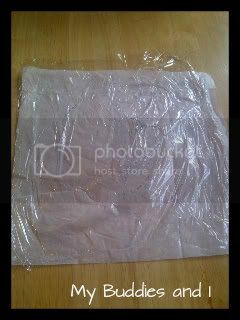 With the plastic wrap over the tissue, the tissue had a nice gloss to it. I balled up a piece of tissue to make the head and tied a ribbon around the neck area. I added eyes and a smiling mouth with permanent marker. Though I would love to have a bunch of these hanging from the ceiling, I have a feeling my buddies aren't going to want to part with their ghosts, so we may end up putting them on sticks to make puppets. 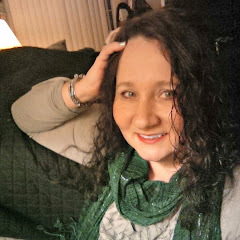 Sharing my glossy ghosts on The Sunday Showcase.